Program solution MPM from MicroStep integrates production and storage with control systems of the CNC machines and software for creation of cutting plans AsperWin and mCAM. The company MicroStep, spol s.r.o., is a renowned Slovak producer of CNC machines used for cutting material using a wide spectrum of technologies (plasma, laser, oxyfuel, waterjet). Furthermore, MicroStep machines offer additional functions like drilling, tapping or marking. The company is also developing and producing transport and manipulation systems, intended for bringing the material into cutting zones and taking away the cut out parts. MicroStep focuses on high-end customers with large production facilities, who put emphasis on effectiveness and high level of automation. Complying with these requirements, MicroStep provides an in-house developed CAPP application called MPM (MicroStep Production Management), which is an integration platform for different parts of the business – material storage, orders department, department for creation of cutting plans and department of CNC machines operators, allowing automation of information flow between them. The MPM software suite includes modules for order processing, cutting plan creation (including the option to make automatic choice and parts nesting), warehouse and cutting machine operation management. Aside from automated nesting, MPM software is primarily aimed at facilitating effective machine use. In an ideal situation, the machine will offer a cutting plan to the operator with the information about the location of the specific material (plate, pipe…) in the warehouse. The operator's role is to place the semi-finished product on the machine, synchronize the coordinate system with the spatial orientation of the product (which can be automated by laser scanning of material edge), install the required consumables and begin the cutting. All the necessary parameters are selected automatically, based on the information contained within the cutting plan. In case of an integrated loading system, the machine also loads the semi-finished product into the cutting area and may also facilitate the unloading of the finished parts. The primary target group for MPM are businesses with multiple cutting machines e.g. job shops and large steel processors in various industries (shipyards and offshore, energy, agricultural, automotive and others). One of the main benefits of this system is the automated task allocation for multiple machines based on the priorities and the technology availability. 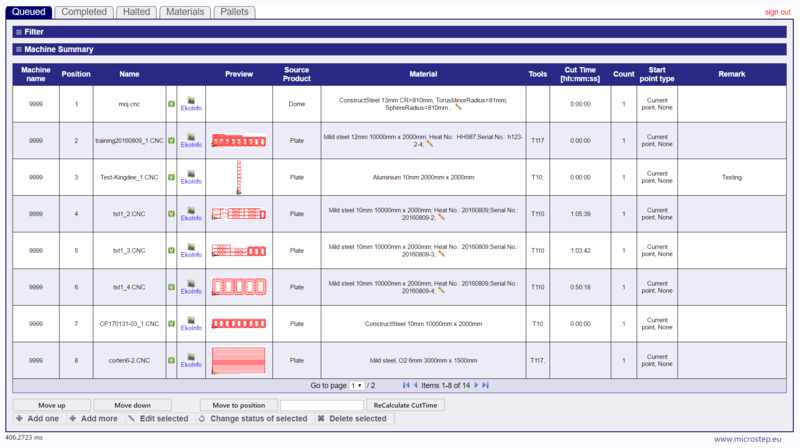 The system offers a unique feature of providing feedback to the database after cutting. After cutting, if specific parts have been cut out incorrectly for some reason, the operator can identify them directly on the control screen. These unprocessed parts are automatically returned to the orders database and assigned the highest priority in the next nesting so that the order is completed as soon as possible. Processing status of each request/part can be monitored in the database, in real time. This feedback feature in the orders database is a unique feature not present among comparable systems on the market and is possible only due to the integration of the management software iMSNC® with the CAM software AsperWin®, both developed by Microstep. In addition, MPM allows for the integration of machines and control systems from other manufacturers. A connection can also be created with customer's ERP system (e.g. SAP, Microsoft Dynamics 365). This data exchange works both ways. New feature of the MPM system is a direct link to the automated material loaders. Workflow is as follows: The machine compares the cutting plans with the inventory of the warehouse and decides what is going to be cut out. It sends a request for the type and amount of material needed to the storage. Warehouse operator takes the material out of the storage and brings it to the machine. The device operator just loads pallet to the extraction position and the rest of the process is fully automated. The machine loads a sheet of metal. The machine can determine whether it is the required material by using a built-in width sensor. This can be also done by an operator or alternatively, by reading a QR code on the metal sheet, if the device is equipped with such technology. After the cutting is complete, the machine sends information about what was cut out to the MCP module (a job list of cutting plans) and information about what kind and amount of material was used to the SQL warehouse database. Customer has access to all this information via their ERP system. MPM loaders are versatile systems which can be adapted for the specific needs of a customer and his production process. Manual loader: The operator manually loads material into the machine according to the orders database. Crane: Metal sheets are loaded on a pallet, their exact order is input into the system by an operator. The crane takes them one by one and cuts following the cutting plan. Pallet conveyor and crane: There are multiple pallets on the conveyor. When one is used up, another one moves into the machine. Loader with tower stock (under development): This solution has many grates, each for a single sheet of metal (Fig. 2). The grates are moving around the tower and the operator is continuously loading new semi-finished products and inputting their information into the system. Good example of integrating the cutting machine with loading system (Fig. 3) using MPM is a solution supplied last year to one of the leaders in production of heating, industrial and cooling systems – company Viessmann. 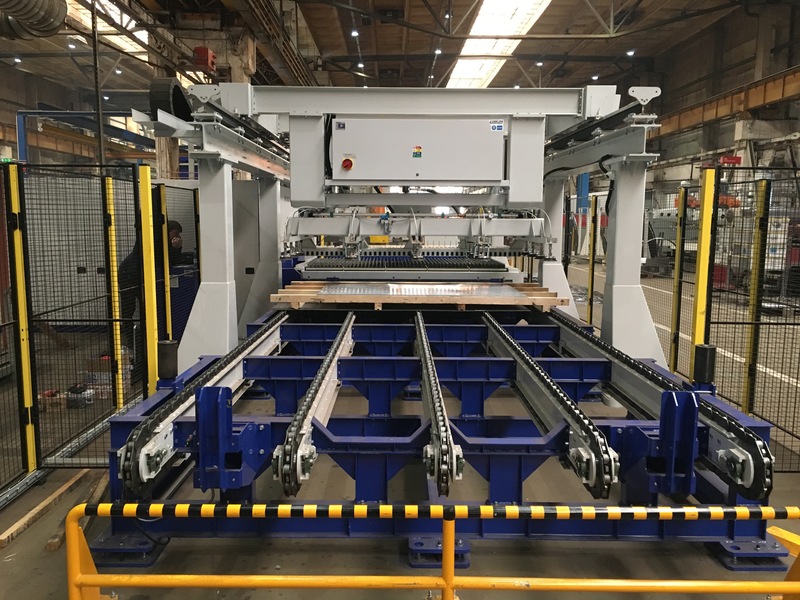 They procured MSF fiber laser cutting machine equipped with automatic loading system VCM with added conveyor, which moves the pallet from the warehouse to the loading position of the VCM. The conveyor can fit three pallets at a time, each with max. weight of 3 tons. The pallets may contain sheet metal of varying width. Width and order of sheet metal is input into the system by the operator and since the machine is equipped also with width sensor, it is capable of confirming this information and automatically chooses the cutting plan. After using up the entire pallet, the control system alerts the operator who gives an order to move in another one into the loading position. Afterwards the machine continues in automatic operation. The operator may meanwhile add another pallet and input its contents. Two new plasma cutting machines from the MG series for Danish machining and manufacturing company Multicut are also innovative solutions of automatic loading and unloading. Each of the 21m long machines is divided into two separate cutting zones. One zone is always designated for cutting. Meanwhile, in the other zone, the cut parts are unloaded followed by the loading of new material. Afterwards the zones switch around. Zone that is currently cutting is always inaccessible from the outside, which guarantees maximal safety at work. The machine identifies material by itself using the QR codes, which can be scanned thanks to a built-in scanner. MPM represents a complex system for automation of the production cycle for cutting machines. It has been already implemented together with MicroStep machines in more than thirty facilities in Europe, Asia and South Africa.